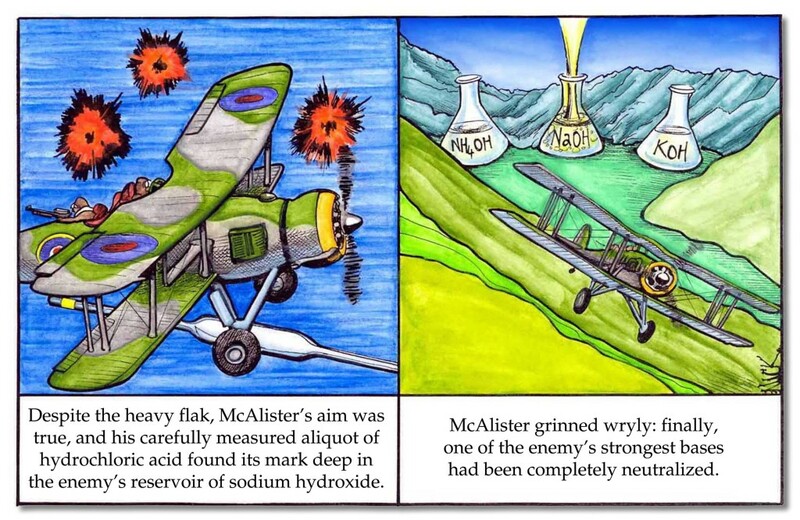 Acids and Bases is quite a conceptual topic, but you don’t have to end up in the trenches over it. Listed here is a summary of the focus areas of each question from Topic 9 of the cbsquared Chemistry for GAMSAT course. With some hints and tips to hopefully steer you on the right track and away from danger. Use the concepts learned in the earlier stoichiometry topic regarding chemical equations. You might need to brush up on balancing equations (check out the practice worksheet in the resources folder). Remember that the generic ACID + BASE –> SALT + WATER only applies in certain cases (namely when hydroxide bases are involved), and is not a blanket statement for ALL acid and base reactions. Now that you’ve learnt about Bronsted and Lewis acids and bases, you need to use these rules to work out which species is the acid and which is the base and what products they are likely to form. A funny video into to Acids & Bases can be found at the Crash Course YouTube page. Write down and understand the definitions of these two ways to categorise acids and bases. Understand the definition and how to identify conjugate acids and bases. If you need a basic intro to conjugate acid/base pairs check out this Khan Academy video or this ChemWiki written resource. The following “cheat table might help when starting out as you can’t use your calculator to calculate logs, so you have to be able to approximate. Notice that the pH of 3.5 comes to a value somewhere between 0.001 and 0.0001. There is no need to be as accurate as the number shown in the table (you wont have a calculator! ), so just approximate. Hints and tips for the remaining questions can be found in the post “Acids & Bases: a Guide to Tutorial 9 Part 2”.